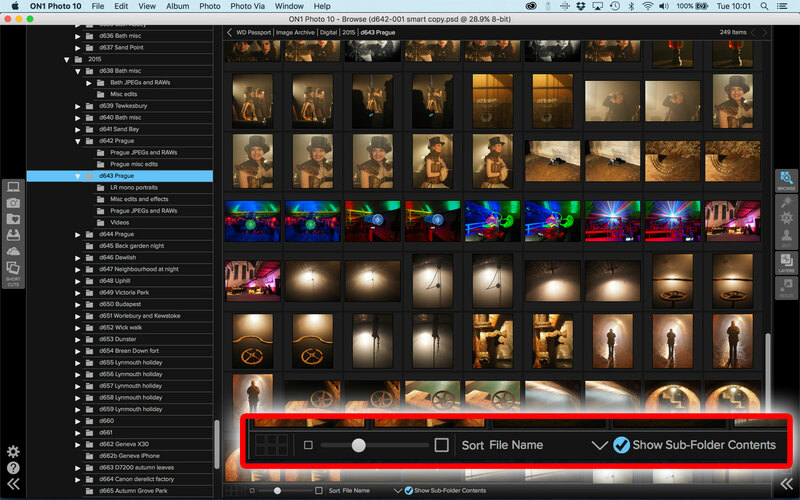 ON1 Photo 10 has steadily evolved from a suite of effects plug-ins into a serious all-in-one image browsing, editing and effects tool. But is it ready yet to rival Photoshop, Lightroom or any of the other big players? Well that depends on what you’re looking for, how you like to work and how much you’re prepared to adapt. I give it a cautious 4 stars. What’s new in ON1 Photo 10.5? 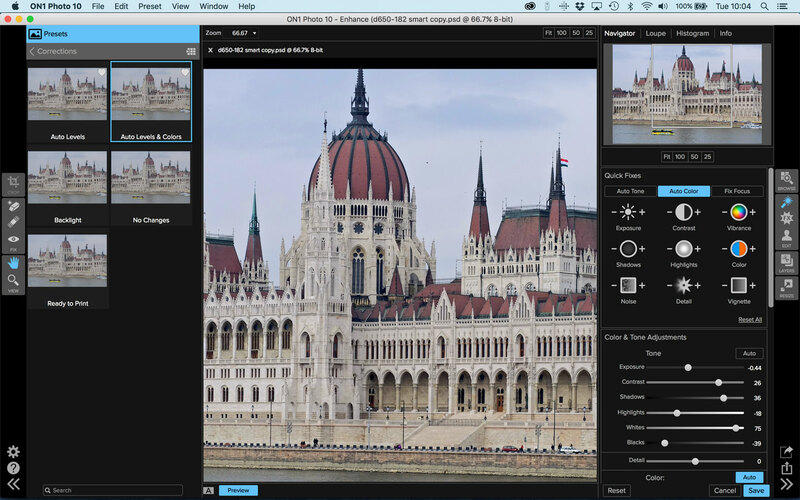 The changes in ON1 Photo 10.5 are relatively minor – the big change compared to previous versions came with version 10.0, which amalgamated a lot of filter effects which used to be separate, brought an updated interface, and came with a new name. Previously, this suite use to be called Perfect Effects, but ON1 must have decided that the addition of photo browsing tools and its expansion into a wider image-editing role called for a name change too. The heart of the ON1 Photo 10 interface is this set of modules on the right hand side. You use these to browse your photos, enhance them, add effects, improve portraits, create layered composites and resize images for output. So version 10.5’s updates are much less ambitious, but interesting nonetheless. One of the strengths of this software is in the Effects module, where you can ‘stack’ and combine effects, masking each one separately as needed. In version 10.5, you only see a mask thumbnail for effects where a mask has been applied, so it’s easier to see at a glance where changes have been made. And if you’re a borders and textures fan – and this is one of ON1 Photo’s strong areas – you can now download and add more than 100 new ones from the ON1 website. 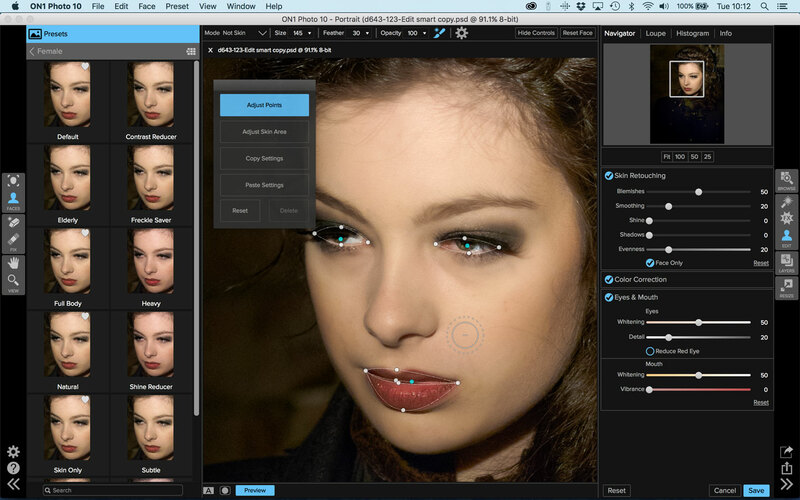 ON1 has also improved its Perfect Brush masking tool. This was already pretty good, using the colour values under the brush cursor to automatically select around object outlines. The new version has Threshold and Transition sliders for fine-tuning the way in which tricky outlines like hair, fur and twigs are masked. The Perfect Brush tool was pretty good already, it has to be said, so this could make it more useful still. Finally, ON1 Photo can now act as a host app for the Google Nik Collection plug-ins. This is a timely move from ON1, which may or may not have anticipated that these were about to become free. There is some crossover here, indeed some competition too – the Google Nik Collections cover a lot of the same territory as the ON1 Effects module – but it’s good that ON1 acknowledges that some users might want to use the Nik alternatives. This feature is almost but not quite sorted. You can send files straight to the Google Nik plug-ins straight from the ON1 Browse mode, but only if they’re in a format the Nik plug-ins support directly. JPEGs and TIFFs are fine, but it doesn’t work with RAW files – you get an unsupported format message. It would be better if ON1 carried out a RAW conversion on-the-fly just like Lightroom, for example, because otherwise it feels like this feature only works with half your files. In fact, this kind of unexpected limitation or inconsistency does become a bit of a running theme with ON1 Photo 10.5. The Enhance module is OK for routine tone, colour and sharpness adjustments but it’s not particularly deep. If you use Photo 10.5 as a standalone app you’ve got a pretty clear workflow using a series of buttons down the right hand side of the screen. The top button opens the Browse module, which offers pretty fast folder browsing with the added bonus of Albums and Smart Albums. So on one level it works like Adobe Bridge, simply showing you the contents of your image folders, but it goes a step further by allowing you to create ‘virtual’ collections of images in Albums, without actually changing their location your hard disks. There’s more. You can also create Smart Albums which act like saved searches, displaying all the photos you took with a particular camera, ones where you’ve used a particular keyword and so on. These aren’t quite as straightforward as they seem, though, because you can only use Smart Albums for images you’ve added to the Browse module’s ‘Favorites’ – these are folders it scans continually for changes and additions. It should be straightforward enough to add a folder containing lots of sub-folders and then have all the photos in this folder tree appear in one long list and not just see a list of folder names – the online help shows a button for this. However, this button did not appear consistently in either v10.0 or the newer v10.5 (tested on two separate Macs), and there seems to be no reference to this online. The button appeared if there were a small number of sub-folders and only one level of hierarchy, but did not appear if there were a couple of dozen sub-folders, say, so it was no good trying to view the contents of an entire image archive, or a year’s worth of images at once. This did badly compromise the Browse module’s usefulness and in particular its Smart Albums. … Except that here it’s disappeared. It doesn’t seem to like too many folders at a time (or maybe too deep a hierarchy). 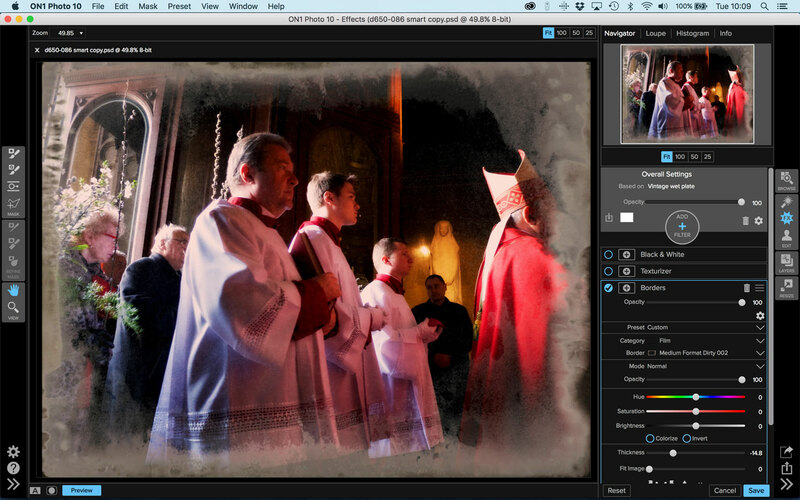 From the Browse module you can open up images in one of the three editing modes in the next section: Enhance, Effects or Portrait. The Enhance module offers a small selection of preset adjustments and enhancements in a panel on the left, but it’s more likely you’ll enhance images manually using the tools on the right. There’s a selection of Quick Fixes for Exposure, Contrast, Color and the like, and below this is a Color & Tone Adjustments panel with sliders for Exposure, Contrast, Shadows, Highlights, Whites, Blacks, Detail and, below this, adjustments for Temperature, Tint, Saturation and Vibrance. Underneath are panels for Vignette effects (does that really have a place here? ), Sharpening and Noise Reduction. This is a pretty modest collection of tools, without even Curves adjustments, so while you might use it for quick and straightforward images fixes or a little preparatory work ahead of applying any effects, that’s about as far as it goes. This is what you might call the jewel in the crown of the ON1 Photo package, and the one module where all the past glories of the ON1 Perfect Photo Suite have been pulled together. It follows the now-familiar format for effects software of offering a whole catalog of image effect presets in one sidebar, on the left of the screen, and manual adjustment tools for modifying these effects or creating your own on the right hand side. ON1 Photo’s preset effects are grouped into a long list of categories, including ‘Architecture’, ‘Black and White’, ‘ Cinematic’ and more – including a whole bunch of ‘PE4’ categories which we must assume are legacy effects from a previous version. These effects are built up using various different ‘filters’ in combination. You can reverse-engineer the effects by choosing one and then seeing the filters used and then modifying them according to your tastes, or you can build your own effects by selecting the filters individually, modifying their parameters and ‘stacking’ them (using masks for each one of necessary) to create effects of your own. You can browse through a catalog of effects in the left sidebar. And you can click a button to see larger renditions in a full screen window. 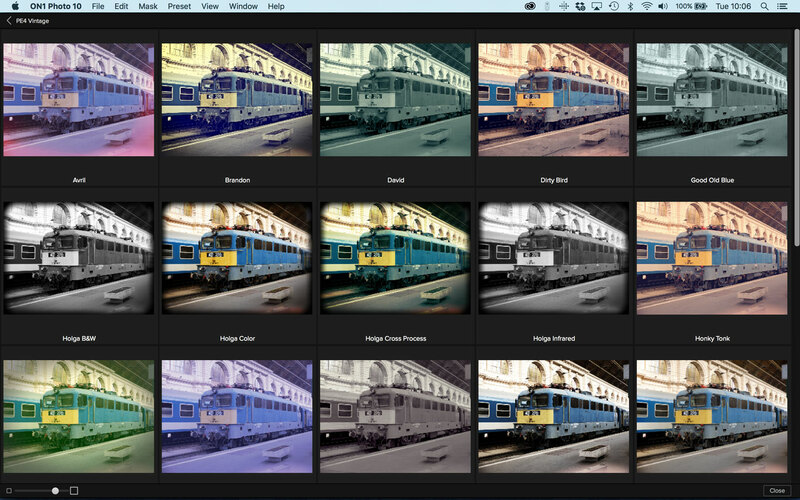 ON1 Photo 10 has a lot of filters, and each can be customised to quite a high degree. You can potter through the preset effects in different categories and conclude that many are not usefully different to others, but you can also come across presets which instantly strike a chord and give your images a ‘look’ which you maybe hadn’t thought of and can apply it with a single click instead of demanding a lot of individual, complex steps in a regular image-editor. The ON1 Effects are a bit of a lucky dip, where much of the time you might be distinctly unmoved but now and again you find a bit of a gem. So there is lots of inspiration to be found here, especially amongst the image borders, textures and ‘retro’ styles. But there are also some oddities, notably the way ‘stacked’ filters are edited. If you want to edit the effect, you’ll often need to adjust a filter mid-way through the stack. This is easy enough – you click the name of the filter in the stack to adjust its parameters. But when you do this, all the filters above it in the stack are disabled. You can change the settings for your chosen filter, sure enough, but you won’t see the result on the final image until you re-enable all the filters above it. You can stack filters in endlessly creative ways, though editing them is odd because all those higher up the stack are disabled while you do it. Powerful as these effect are, then, there’s something dated and linear about the way the filters are applied. They are individually editable, but only in an unexpectedly clunky way. If you edit an individual filter you have to re-enable all the others stacked above it to see the outcome. This feels like yesterday’s editing technology struggling valiantly to appear as if it’s today’s. Having said that, some of these cumulative effects really are very good, so it’s not so easy to write off ON1 Effects as a has-been after all. Not only that, the filter masking tools add an extra layer of control, especially now that the Perfect Brush masking tool has been improved. 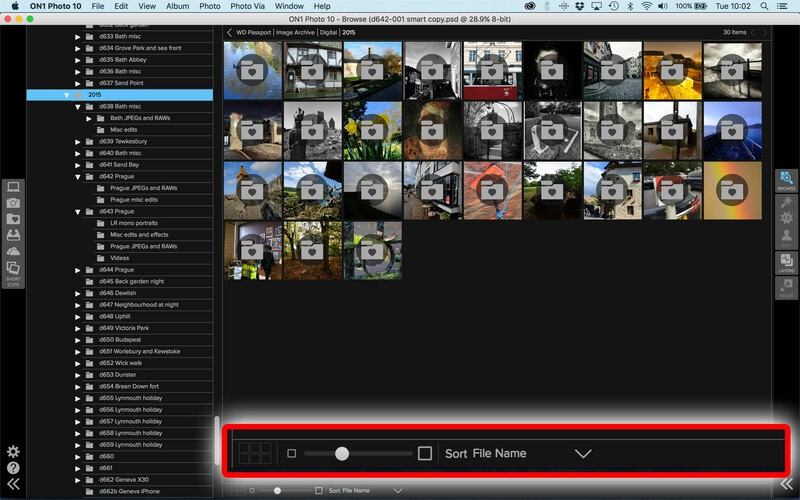 It does have an especially neat trick – you can save images in ON1’s special Smart Photo format, so that you get a working Photoshop format file that other applications can use, but it also incorporates ‘live’ the filter adjustments you applied in ON1 Effects, so that you can go back later, reopen the file and change them if you want to. The icon for the separate ON1 Portrait module actually says ‘Edit’, with only an icon for a human torso to indicate its real function. It also seems odd to have an entire module dedicated to a relatively specialised task when all those myriad effects that this program is capable of are crammed into one other. Giving the Enhance and Portrait modules the same prominence in the interface as the Effects module rather sends the message that they are equally important, which is surely not the intention because they are relatively minor by comparison. ON1 Portrait uses face recognition to first of all find the face in your picture and then offers step by step instructions on identifying key features, namely the left and right eyes and the left and right corners of the mouth. This produces adjustable eye and mouth outlines which you can drag into position to match these features on your subject’s face – the software will also automatically identify skin tone areas, though you can adjust these too if you need to. ON1 Portrait uses adjustable marquees to identify key facial features for enhancement, but does not offer the ‘face morphing’ features of other portrait plug-ins. Now you can start adjusting the sliders in the Skin Retouching, Color Correction and Eyes & Mouth sliders – or use one of the preset enhancement effects on the left side of the screen. These are split into ‘Children’, ‘Female’, ‘Groups’ and ‘Male’ categories. It does work pretty well, though the controls are limited and you have to be very careful with your Smoothing slider if you don’t want your subject to look like a porcelain doll, but it’s the same with other portrait enhancement tools of this type, and the presets here are for the most part fairly subtle. What you don’t get are the terrifying face-morphing tools in other portrait enhancement plug-ins, which is a good thing if you don’t approve of reshaping people’s faces to make them look more ‘attractive’, but it also shows this module’s limitations. Does it really deserve equal status in the program interface? The Layers module is especially interesting because when it’s used as a plug-in it offers Photoshop-style layers capability to programs which don’t have it. The obvious candidate for this is Adobe Lightroom, though these days the most sensible option is to get Adobe Lightroom CC as part of Adobe’s Photography Plan, and this comes with Photoshop CC too, which takes care of all your layering needs perfectly well. But then you might be using ON1 Photo as a standalone app, in which case the Layers module is a great way to create montages, cutouts and other special effects. You can use all the blend modes available in Photoshop, for example, such as Multiply, Screen, Overlay and more, and you can also adjust the layer opacity and apply a range of powerful and effective masking tools, including a clever Masking Bug which you can drag around the image to create a gradient mask. You can also carry out a few image repairs while you’re at it, using the Clone, Retouch and Perfect Eraser tool – and the latter does a pretty good job of removing unwanted objects and pulling in surrounding detail to cover the gap. If you want to do more than that, though, you’ll have to migrate the image layer to one of the other modules, make adjustments and then return to the Layers module. This is a reminder that ON1 Photo has evolved from a much larger collection of individual modules, and while ON1 has got them integrated pretty well now, there are still times when you have to swap contexts to get a particular job done. The layering and masking tools in ON1 Layers are broadly on a par with those in Photoshop. 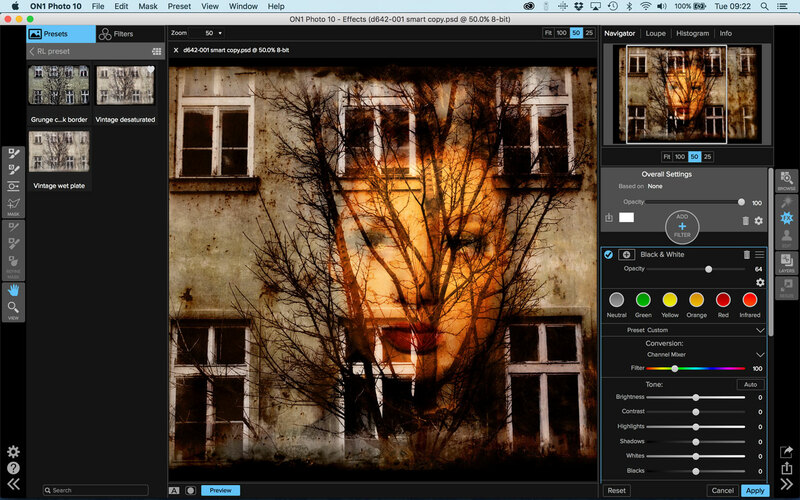 You can also migrate individual layers back to the Effects module and have them returned as re-editable Smart Layers. There are some lingering inconsistencies, too, so that the file browser visible in the Layers module is not the same as the Browse module itself – if you want to take advantage of the Browse module’s more advanced image management tools while you’re working in Layers mode, you’re going to have to make a quick round trip there and back to find the images you want to add to your layers. But there are some unexpected features. You can add an effect to an image layer and it remains editable, thanks to ON1’s Smart Layer technology. That’s a nice touch, so that although you do have to go jumping between the modules from time to time, you preserve a lot of editing flexibility all the way through the workflow. The Resize module is worth a quick mention because it offers that holy grail of digital imaging – high-quality upsizing. Publishers have long since abandoned the idea that fractal imaging technology can make any bitmap image infinitely resizable – the information captured in the original will always be the limiting factor – but it is possible to do something about the blurring that happens with regular upsampling. This happens because the software has to extrapolate image detail around object edges based on the surrounding pixels, and will generally insert ‘in-between’ pixels with averaged values alongside previously sharp edges. ON1 Resize, however, can identify sharp edges and details and preserve these during the upsampling process. You don’t get any more image information than was present in the original, but neither do you get the degradation in sharpness that regular upsampling produces. This doesn’t mean you can produce 24-megapixel camera quality from a 12-megapixel camera, but it does mean you can produce giant enlargements with improved visual sharpness. It’s a tool worth having, but not one you’re likely to use very often. You probably wouldn’t use ON1 Resize on a daily basis, but it could be handy for upsizing smartphone images for big prints or regular camera images for billboard or poster reproduction. ON1 Photo 10.5 is tough to rate. It’s unlike any other software out there, and there are inconsistencies and imbalances in its interface that can very easily distract you from some rather good tools and effects. It doesn’t run particularly well on my Macs either, with a sometimes jerky response and slow filter redraws. It might run better on Windows PCs – I will try this some day – but Lightroom, Photoshop and other tools run pretty well on my MacBook Pro, so I’m not at all convinced it’s a hardware issue. I don’t like the way all of the effects are crammed into a single Effects button on the interface. They are the real guts of this program, and they deserve more prominence than that – the Enhance and Portrait modules have far less depth. I don’t much like all the swapping around between modules, either, and while long-time ON1 users may find the ON1 workflow smooth and familiar, I think newcomers are in for a rougher ride. And yet I still rather like ON1 Photo 10.5. For all its clunky inconsistencies and its work-in-progress feel, it incorporates some terrific preset effects and the tools for creating plenty of your own. If I was looking for a single standalone all-in-one image-editing tool I’d certainly consider it, though most of us these days use not one program but several (correct me if I’m wrong), and I wouldn’t use ON1 Photo 10.5 to organise my photos or enhance any portraits. But I would use its Effects module, and perhaps its Layers module too if I didn’t have access to Photoshop. So I’m going to give it a cautious 4-star rating. I find it clunky and confusing but full of hidden depths and great effects. It demands some effort, but I think it pays you back. If you want high-speed batch-processed preset ‘looks’, use Lightroom, but if you like to roll up your sleeves and really work individual images, then ON1 Perfect 10.5 could be right up your street. As a long time user of ON1 as a “sort of photoshop” plugin for Aperture>Lightroom> and now Capture One, I was recently intrigued by the announcement that ON1 will introduce RAW conversions this Fall. They claim they will support over 600 cameras and many formats. As an amateur, using ON1 stand alone may become a viable alternative …. now if I can just remember that I am supposed to be taking images and not just playing with software! One thing I discovered is they used to offer top notch support. If you had a problem you could call them up and they could help identify what the problem was and how to solve it. Now they merely send a link and I can’t figure out what I am doing wrong. From a world class product support to the most frustrating support I ever experienced. Raw seems to have allot of potential if it works and if it is properly supported. I get a free upgrade to raw when I purchased On1 10.5 so I will see if that is worth my time. 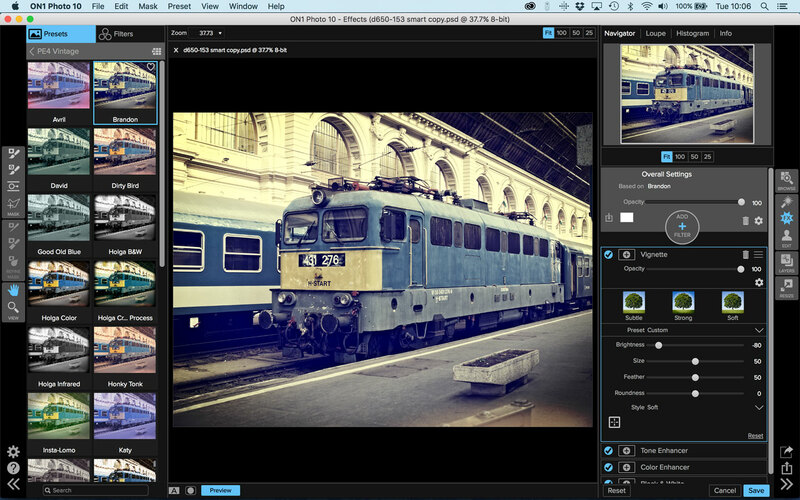 After that I think I will be looking at other third party plugins like Topaz. I use Google Nik the most and highly recommend it. It is offered free from time to time so check that out. How do you send to nik collection from browse? Rod – didn’t see a “contact us” link here so I suppose this is the best way to ask a general question. Are you planning to evaluate 10.5’s successor – On1 PhotoRaw – at some point? Also, do you feel ACDSee Ultimate is worthy of some coverage? It certainly falls in the Lightroom/On1 category with the blend of DAM/converter/editor. Woops – just realized these reviews are Mac-centric, so I can certainly understand why ACDSee may not have risen to an appropriate level of attention (I’m a Windows user). I really enjoy your reviews here and look forward to seeing more – even if it’s all cross-platform stuff. I wouldn’t say my site is Mac-centric, certainly not deliberately. I use a Mac, but I try to stick to cross-platform apps – obviously the MacPhun software and early Serif Affinity Photo version is Mac-only. I do use Windows too when reviewing software for magazines. Good point, Dale. Yes, I do intend covering ON1 Photo Raw. As for ACDSee Ultimate, I have to confess I’m not a big fan. I find it quite clunky to use and for me it doesn’t really add anything. Yeah, I can relate to the “clunky” characterization but I found v. 10 a bit of an improvement, and better (imho) than the initial On1 Photo Raw release. I’m staying with it for familiarization in parallel to Lightroom which, at version 6.9 standalone, still offers for me the most refined combination of features I tend to use. Thanks for the response. There’s a nearly dizzying range of options out there. I see On1’s been manically racing to catch up to Photo Raw’s prodigious hype. If they manage to do that, the product could be worth at least a little trial time, and I look forward to your observations.